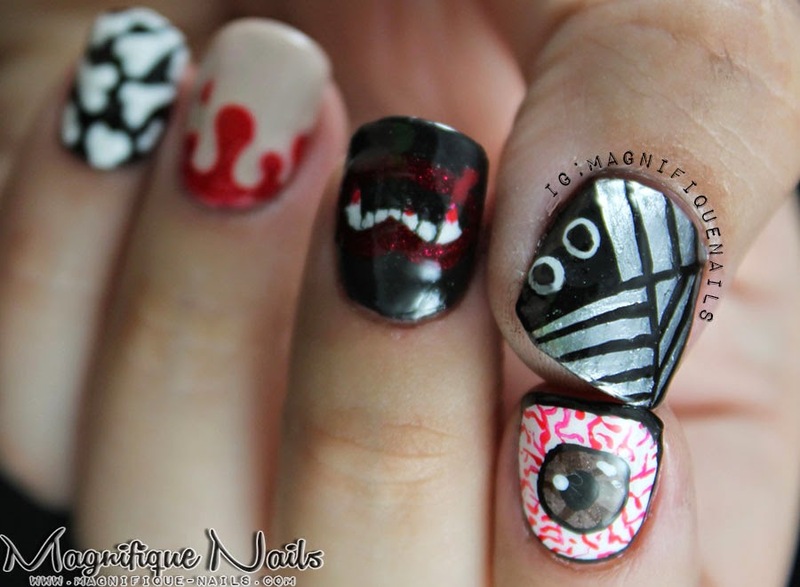 Magically Polished |Nail Art Blog|: Happy Halloween!! Hiya Everyone! Happy (early) Halloween!! I can not believe we're half way there towards the end of the year. October flew by incredibly fast! 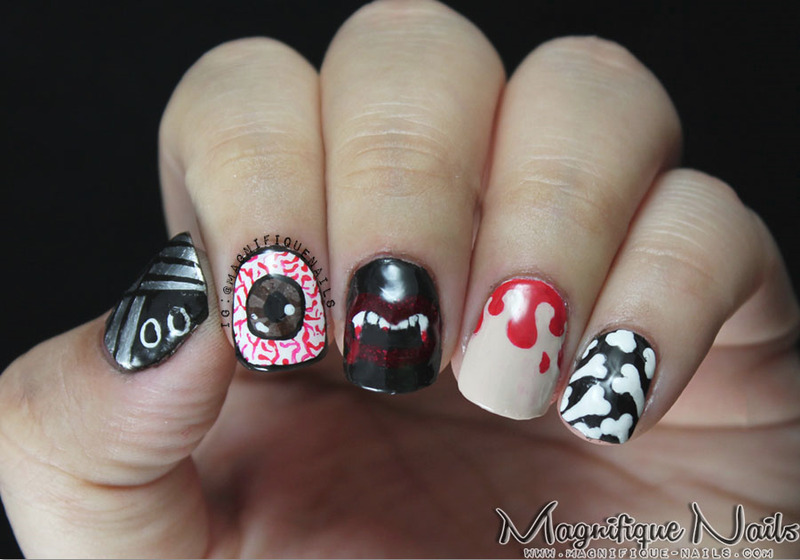 For today's post, I have my last Halloween nails...until next year!I for one really don't really like wearing costumes, so I've decided to do a mix'match theme on my nails. It was definitely hard to choose a design, so I've decided to to them all. I wanted each nail to have a different designs. 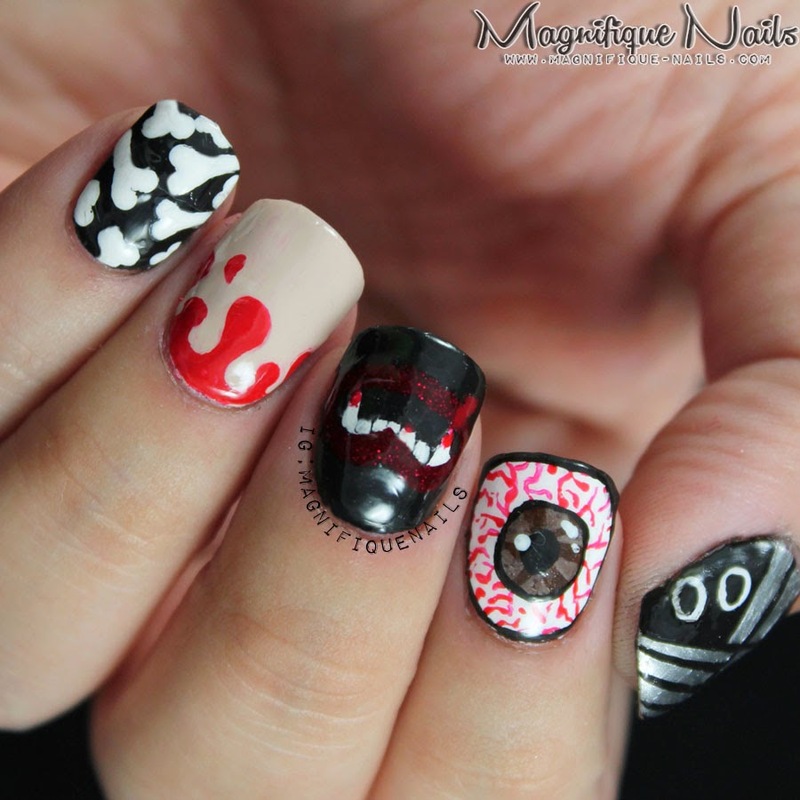 So for the base on each nail, I applied two coats of Pop Beauty Black on the pinky and middle finger. Two coats of Julep Bunny on the forefinger. Two coats of Julep Florence on the ring finger and two coats of Morgan Taylor Could Have Foiled Me. That's pretty much it...lol! 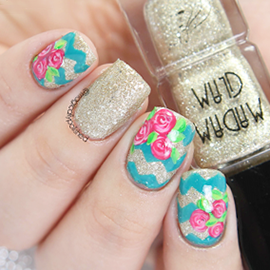 It's pretty simple when creating these designs, all I really needed was a dotting tool and nail art brush. For the Eye, I didn't want to create the typical blue, since mines are brown. I used 32 Flavors Nail Candy Brown Sugar. I just love how animated it looks. For the border around the pupil and the nail, I used Pop Beauty Black I then drew squiggly lines around the pupil with Julep Jackie. For the the blood drips, I used Julep Julep Jackie. I outlined the drips and then filled them in. For the bones, with a dotting tool & nail art brush, I drew the skeleton bones using Julep Bunny. For the adorable mummy, I pretty much drew the lines differently and filled in where the mummies eyes will be. Lastly, for the vampires teeth, was an improvement I did last year. I really loved how it complements the rest of the creepy designs. 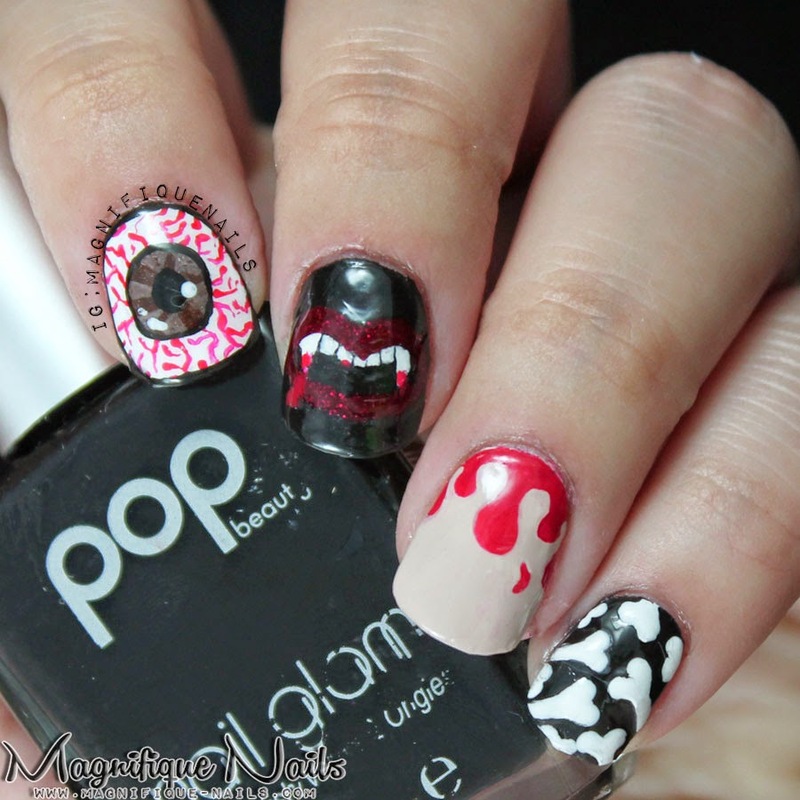 I used Julep Jackie for the lips and highlighted with Fright Night Claw Polish Voodoo. Sealed the design with top coat.